If you’ve noticed spots on your caneberry stems or foliage, they’ve likely been affected by septoria. While this doesn’t necessarily spell disaster for your plants, it’s certainly not something you want to have spreading throughout your crop. Read on for tips on managing the disease in your garden. What is Septoria Cane and Leaf Spot? Spores are disseminated by wind and water splash. All cane berries are perennials, as the roots come back year after year. 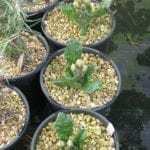 However, the plant above the soil is biennial – the canes grow vegetatively for a year, bear fruit the next year, and die. Every year the plant sends up new canes to replace those that died. Septoria cane and leaf spot happens most commonly on closely planted canes, especially those with foliage that has gathered around the base restricting the air flow between the canes. Signs of cane and leaf spot are light to dark brown spots that start out purplish. 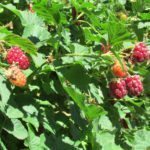 To avoid symptoms of septoria, space berry plants 5 to 6 feet (1.5 to 1.8 m.) apart, in rows about 8 feet (2.4 m.) apart. Cane berries fruit from May to September depending on the location, so this disease generally affects plants late in the growing season, typically in August or September. Although not the most serious of fungal infections to plants, symptoms of septoria is a weakening of the plant and defoliation which will hinder its ability to winter over effectively, resulting in plant death the following season. It is sometimes mistaken for anthracnose (Elsinoe veneta) or dieback that affects plants in the spring and results in seasonal death of canes if left untreated. Anthracnose lesions are irregular. Leaf spots may also resemble blackberry rust but have no yellow pustules on the lower leaf surface. Look for small, round leaf spots, about a tenth of an inch across, that start out purplish and turn brown as it progresses. Spots appear on both leaves and canes and remain small with light brown or tan centers. Older leaf spots have whitish centers surrounded by brown. 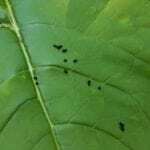 Tiny black specks are visible when inspected with a hand lens developing in centers of leaf spots. Check canes for similar lesions. This fungus overwinters in dead plant debris and on infected canes. Splashing or wind-driven rain releases spores in high numbers and carries them to young susceptible leaves and canes. The fungus germinates in a film of moisture and penetrates leaf or cane tissue. As leaf and cane spots form and age, new fungi form in the centers. These also produce and release spores creating more septoria diseased plants throughout the growing season. Long periods of rainfall are highly conducive to disease development. The key to managing leaf spot is to increase air circulation within canes and reduce sources of previous infection. Proper spacing, thinning to maintain proper cane density, controlling weeds and removing dead and damaged canes and leaf debris after harvest lowers canopy humidity and allows faster drying of foliage and canes, resulting in less infection. Selective pruning is a perfect way to manage septoria cane and leaf spot; simply remove the old canes that already bore fruit and let new ones take their place. Remove old fruiting canes at the ground when they have died back. This allows the dying canes to move nutrients back into the crown and roots. 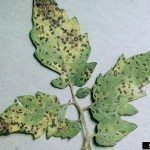 No fungicides are currently registered for use specifically against this disease; however, fungicides used to control anthracnose and botrytis gray mold may help control leaf spot in general. In addition, sprays of copper sulfate and lime sulfur offer some control and are considered organic septoria treatments. Read more articles about Berries.